The game at the New Jersey Meadowlands on October 7, 1979 looked to be a classic mismatch. The upstart Tampa Bay Buccaneers were 5-0 while the host club, the New York Giants, had started off at 0-5. Moreover, Tampa Bay had the league’s top-ranked defense while the Giants ranked at the bottom in offensive production. The Buccaneers, under the guidance of Head Coach/GM John McKay, had gone from a 0-14 expansion team three years earlier to surprising contender primarily thanks to the outstanding defense anchored by DE Lee Roy Selmon and including such stalwart performers as DE Wally Chambers and linebackers Richard Wood and David Lewis. However, they were missing ILB Dewey Selmon, Lee Roy’s brother, who was out with a badly bruised arm. The ball-control offense featured FB Ricky Bell along with second-year QB Doug Williams, who was still very much a work in progress, operating behind an outstanding line. TE Jim Giles was the best of the receivers as well as a potent blocker. New York had a new head coach in Ray Perkins, trying to turn around a team that had known little success since last appearing in the postseason in 1963. Against the Bucs, they were unveiling a new starting quarterback in rookie Phil Simms, the first draft choice out of Morehead State, as well as a new 3-4 defense. They also had HB Billy Taylor (pictured above) starting in place of the injured Doug Kotar. It was a cloudy afternoon at Giants Stadium with 72,841 fans in attendance. Following a punt by the Buccaneers, the Giants moved into Tampa Bay territory on their first series. A 15-yard penalty on Tampa Bay tacked onto an eight-yard gain on a pass from Phil Simms to FB Ken Johnson advanced the ball to the 41, but after moving to the 29 Johnson fumbled on a running play and NT Bill Kollar recovered for the Bucs. 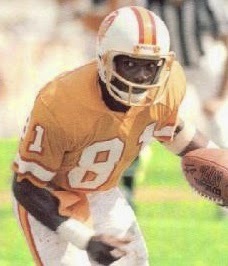 The teams traded punts and Tampa Bay, attempting to convert a fourth-and-one at the New York 39, failed when Ricky Bell was stopped for no gain. New York came alive on offense as Billy Taylor ran effectively, including back-to-back gains of 27 and 15 yards to the Tampa Bay three. Two plays into the second quarter, Taylor dove into the end zone from two yards out and, with Joe Danelo adding the extra point, the Giants took a 7-0 lead. New York got the ball back a short time later when DB Odis McKinney intercepted a Doug Williams pass and returned it 25 yards to the Tampa Bay 11. Taylor ran the ball five straight times, the last for a one-yard TD. Danelo again converted and the home team was now ahead by 14-0. The teams exchanged punts until the Bucs, taking possession with 3:58 remaining in the first half, put together a 72-yard drive in nine plays. A 15-yard roughing the passer penalty on DE Gary Jeter helped the visitors out of a third-and-16 hole, Williams connected with WR Isaac Hagins for 24 yards, and Bell had a 22-yard carry to the New York 17. Williams threw to WR Larry Mucker, who bobbled it but finally held on for a 14-yard touchdown, Neil O’Donoghue added the extra point, and the halftime score was 14-7. The teams again traded punts to open the third quarter before the Giants, starting at their 39, picked up a first down out of punt formation when Dave Jennings ran for nine yards to convert a fourth-and-five situation. A personal foul on the Bucs advanced the ball to the Tampa Bay 27 and the Giants reached the 21 before Simms was sacked by DE Reggie Lewis for a loss of seven yards on third down and Danelo was wide on a 45-yard field goal attempt. Once again the teams punted the ball back and forth, with neither offense able to move. Such was the case until early in the fourth quarter. After a throw for an apparent first down was nullified by a penalty, a Williams pass was picked off by CB Terry Jackson, giving the Giants the ball at the Tampa Bay 31. New York still couldn’t move offensively, but Danelo kicked a field goal from 47 yards to make it a ten-point game. After another exchange of punts, Tampa Bay began to advance with Williams throwing on almost every play. He connected with Hagins for 22 yards and Bell for 10 to the New York 40, but three straight passes fell incomplete and, on fourth down, LB Brian Kelley came up with an interception. The Giants went three-and-out and, following the punt, Tampa Bay put together a seven-play, 79-yard drive as a hard rain began to fall. Williams completed four passes, including one to Hagins for 32 yards that set up an 11-yard scoring throw to Jim Giles. O’Donoghue converted to make it a three-point contest, but the clock was down to 1:50 and the onside kick attempt failed. The Giants came away upset winners by the score of 17-14. The Buccaneers had the edge in total yards (273 to 220) while each club generated 15 first downs apiece. 202 of New York’s total came on the ground, with only 18 net yards through the air. Tampa Bay also turned the ball over three times, to one suffered by the Giants. There was a total of 16 punts, evenly distributed between the teams. 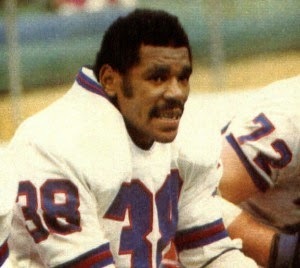 Billy Taylor was the offensive star for the Giants, rushing for 148 yards on 33 attempts that included two both of the team’s touchdowns. The rushing total was the most for a Giants’ back since 1967. Phil Simms completed 6 of 12 passes for 37 yards, and while the numbers were modest and there were no touchdown passes, there also were no interceptions. TE Gary Shirk and Ken Johnson had two catches apiece, for 15 and 11 yards, respectively. For the Buccaneers, Doug Williams, who was off-target on most of his passes, was successful on just 14 of 38 throws for 182 yards and two TDs while giving up three interceptions. Jim Giles had 5 receptions for 43 yards and a touchdown and Isaac Hagins (pictured at right) gained 77 yards on his three catches. FB Johnny Davis ran for 40 yards on 7 attempts to lead the team while Ricky Bell was held to 35 yards on 12 carries. The win over the Buccaneers was the beginning of a four-game win streak for the Giants, and while they tailed off later in the season, they finished at 6-10 and fourth in the NFC East. Tampa Bay lost again the following week but recovered to top the NFC Central with a 10-6 record, reaching the NFC Championship game before falling to the Rams. The Bucs also thrashed New York by a 31-3 score in the rematch in Tampa Bay. Billy Taylor went on to lead the Giants in rushing with 700 yards on 198 carries (3.5 avg.). He also caught 28 passes for 253 more yards and scored a total of 11 touchdowns. Phil Simms continued to show promise in his first year, spurring the four-game winning streak and passing for 1743 yards and 13 TDs against 14 interceptions.